The most captivating and controversial presidential race in recent memory is coming into the homestretch as American voters prepare to elect their next commander in chief on November 8. Hillary Clinton has maintained a lead over Donald Trump since the parties held their respective national conventions this summer, as support for both candidates has fluctuated significantly. Both candidates have been burdened by very high unfavorable ratings (which may impact the victor’s ability to govern). Clinton and Trump each have what seems to be an immovable base of supporters, so their campaigns have focused on courting voters who remain undecided. At the time this issue went to print, Clinton and Trump had participated in two of three presidential debates and their respective running mates, Virginia Senator Tim Kaine and Indiana Governor Mike Pence, had faced off in the sole vice presidential debate. While the debates focused heavily on the candidates’ character and record rather than their actual policy proposals, law enforcement issues received a significant amount of attention. 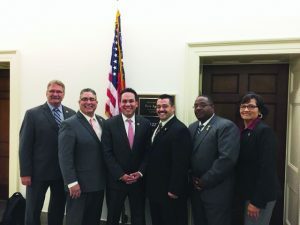 During the September fly-in, PORAC met with numerous California representatives. Pictured here are President Mike Durant, Director Mike Fender, Congressman Pete Aguilar, Treasurer Marcelo Blanco, Director Tony Sanders and Virginia Tinoco (Ventura County DSA). During the presidential debates, the candidates were asked how they would heal the divide that exists between law enforcement and the communities they serve. Secretary Clinton favored addressing the problem with a multifaceted approach: restoring trust between communities and the police, ensuring police receive the best possible training and preparing police to use force only when necessary. She also emphasized that the country needs to address systemic racism in the criminal justice system and said that, as President, she would specifically provide funding to help law enforcement agencies deal with implicit bias. In addition, Clinton said she would pursue reforms to divert people from the criminal justice system, eliminate “overly severe” mandatory minimum sentences and implement more second chance programs. Significantly, Clinton emphasized that to achieve any criminal justice reform, law enforcement must have a seat at the table and contribute their perspective to the conversation. With regard to gun safety, she called for comprehensive background checks and prohibiting anyone on the terrorist watch list from buying a firearm. Mr. Trump depicted himself as the law-and-order candidate. Using the high murder rate in Chicago as a starting point, Trump spoke about the scourge of gun violence in inner cities and proposed implementing “stop and frisk” procedures in certain areas, saying they were extremely effective in New York City (where the practice has been ruled unconstitutional). He said the goal of stop-and-frisk is to get guns off of the streets and, in turn, reduce the incidence of gun violence. The practice, Trump emphasized, would target gangs, which he said were a growing problem perpetuated by illegal immigration. He did agree with Clinton that people on the no-fly list should not be able to buy guns. Senator Kaine agreed with Chief Brown’s comments and emphasized the importance of building “bonds of understanding” to narrow the gap that exists between communities and police forces. Kaine cautioned that police over-militarization and policies like stop-and-frisk would only increase polarization between law enforcement and communities. In addition to enhancing community policing efforts, Kaine said that a Clinton Administration would enact a comprehensive mental health reform package to assist law enforcement in responding to mental health crises. Governor Pence said that he and Trump would make sure that law enforcement has the resources and the tools needed to “restore law and order” across the country. He said people should stop seizing on police-involved shootings to accuse law enforcement of implicit bias or institutional racism, because doing so is demeaning to law enforcement officers. Harkening back to his time as Governor of Indiana, Pence spoke about his efforts to implement criminal justice reform and called on Americans to recognize and correct errors in the system that do reflect an institutional bias in criminal justice. Nevertheless, he stressed that people must understand that law enforcement is a force for good — not a force for racism or division. Prior to adjourning until November 14, Congress took action on a number of legislative matters. Just two days before funding for the federal government was set to expire on September 30, Congress passed a continuing resolution (CR) that will fund the government through December 9. The legislation maintains funding for federal programs at the previous year’s levels, and provides $1.1 billion to combat the Zika virus and $500 million in emergency flood relief funding. The House also voted unanimously to amend and approve a Senate-passed bill that would update the Federal Communications Act for the first time since 1996. The legislation, which will modernize America’s telecommunication systems, passed the Senate in June. Among the provisions added in the House version of the bill is the Kari’s Law Act, which PORAC advocated for in meetings with congressional offices during the September fly-in. The bill was inspired by the murder of Kari Hunt, which took place in a hotel that required users of the hotel’s telephone system to dial an additional number to gain access to an outside line. Despite repeated attempts by Kari’s young daughter to call the police from the hotel room where her mother was being murdered, the child was unable to reach police because she did not know she had to dial “9” to get an outside line. To prevent such situations from occurring again, the Kari’s Law Act would require multi-line telephone systems (such as hotel and office telephone systems) to have a configuration that permits users to directly initiate a call to 9-1-1 without dialing any additional digit, code, prefix or postfix. Before a final version of the Senate and House bills will be sent to the President for signature, the two chambers will have to convene a conference committee to reconcile the differences between the two versions, although the timing of such negotiations remains unclear. Various law enforcement agencies and entities in California have been awarded a number of significant Department of Justice (DOJ) grants designed to improve criminal justice and public safety. The California Department of Justice has been awarded two grants from the DOJ’s Office of Community Oriented Policing Services (COPS) to address the production and distribution of heroin and other opioids as well as methamphetamine use. The $1.277 million grant from the COPS Anti-Heroin Task Force Program will support investigations of illicit activities related to the distribution of heroin and unlawful distribution of prescriptive opioids. The other $1.447 million grant was awarded by the COPS Anti-Methamphetamine Program and is designed to assist agencies that seize methamphetamine precursor chemicals, finished methamphetamine and drug laboratories. In addition to the two grants described above, the State of California was awarded $866,892 through the Office of Justice Program’s Residential Substance Abuse Treatment for State Prisoners Program. The funding will assist local, state and tribal government agencies in improving evidence-based substance abuse treatment programs for incarcerated inmates, as well as to prepare individuals who have been involved with the criminal justice system for reintegration into local communities. California is also one of 32 states set to receive a total of $20 million through the DOJ’s Body-Worn Camera Policy and Implementation Program. The awards will help law enforcement organizations implement body-worn camera policies in order to improve the quality of community-based policing. Finally, Scripps College in Claremont, California, has been awarded a grant from the DOJ’s Office on Violence Against Women. The grant is one of 61 awards totaling $25 million that have been given to educational institutions and advocacy organizations across the country to help student victims of sexual assault, domestic assault, dating violence and stalking. The awards will make possible a range of services, including specialized training for campus law enforcement, health care providers, university housing personnel and other first responders.